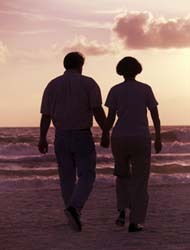 God has blessed the human institution of marriage as an opportunity for two individuals to develop wholeness. Marriage is meant to be mystical, commemorating the soul's reunion with God, and fruitful, blessing the earth with a magnanimous love. That love is a magnet that enables you to become more of God. So you see the hallowed circle of marriage as a place where you love more of God and draw down more of his energy. Therefore you have a greater ability to fulfill your mission, to help others, especially through the intimacy of family relationships. In the marriage relationship, as in all relationships, we are putting on more of God's consciousness by understanding one another and becoming that which we perceive of God in each other. Without relationships, we could not develop. If you put a newborn baby in a room alone and deprived him of contact with people, he would not develop. In fact, he would probably die. He needs the stimulation of other people, which is really interaction with the presence of God in each other. So the marriage relationship is also an opportunity for spiritual development. And when you run into the inevitable challenges of marriage, you may be tempted to give up on the relationship unless you understand what a great opportunity marriage is for inner resolution. Excerpted from: Nurturing Your Baby's Soul by Elizabeth Clare Prophet, Joye Bennett and Nancy Hearn. Summit University Press, 2000.